Sometimes you miss some good looking fonts available over the Internet, mostly because you work on design or you just want to make something look better. 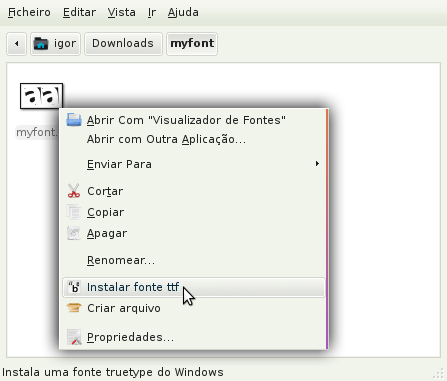 However, most of the fonts are in the truetype format, which is a little bit tricky to get to work in Ubuntu. The process of installing TTF fonts manually isn't very complex, but doing it over and over again everytime you want to install a new font can become tiring. That's why I wrote a little application in C which does all the work for you. To start using it you just have to download it from here. Then extract the archive and using the terminal, go to the folder where you extracted it, using the command cd. That's it! Now the font is installed and ready to be used. If you use Thunar as your default file browser it can also be very usefull having an option in the file's context menu which installs the font for you. That way you wouldn't even need to open the terminal, you would just have to right click on the font and select "Install". Switch to the Appearance Conditions tab and for the File Pattern write: *.ttf. Remove the check from "Text files" and put "Other files" instead. Click OK and close the Custom actions window. Now just right click under some ttf file and test it, your new option should be right there. Could you be so kind as to publish the source code? Thanks for checking it, i really apreciate it. I've uploaded a new package which includes the source code, im sorry I haven't done this earlier but i haven't checked on this page very often.